Abzag the Monster is an Orc member of the Undaunted found with his companions at The Rosy Lion. He will tell you about Fungal Grotto and The Banished Cells, marking their locations on your map if you have not yet discovered them. 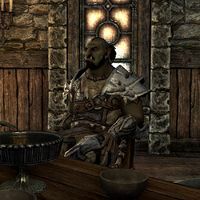 You will meet him again at the Dead Wolf Inn in Shornhelm, where he will tell you about the City of Ash and Arx Corinium. Mighty Mordra: "Listen up, you bunch of corset-wearing dog-diddlers! We got a new piece of meat on the rack, fresh from the butcher's block!" Abzag the Monster: "Hear, hear! I've got a proper welcome for 'em—right down in my breeches!" Lady Blade: "Might be that's a monster they could actually slay, eh Jalid?" Magnifico Jalid: "Always with the breeches. You lot should get out more. Besides, that's no proper welcome. I propose a toast!" Abzag the Monster: "Hear, hear! A toast!" Lady Blade: "To the new meat's mother. May she have many healthy children—since this one's a goner!" Magnifico Jalid: "To the new meat's lover. May their tears be few and silent——so I don't have to hear it when this one dies!" Abzag the Monster: "To the new meat's face! May it always bear a smile—so it doesn't look so ugly mounted on a pike!" Mighty Mordra: "A fine toast to a fine piece of meat. Now let's have a song to finish them off!" Abzag the Monster: "Who knows no fear … of beast or blade?" Magnifico Jalid: "Who knows no fear … of death? Of age?" "Let me know when you kill a real monster. Or if you'd like to try this monster on for size …." He can also be met in the Dead Wolf Inn with Brulo Bloodletter and Ilmindil the Incendiary. "Look what the cat dragged in. You kill anything bigger than a spider yet?" This page was last modified on 18 February 2019, at 10:12.